Rain has arrived. In copious amounts that is. A strong cold front is advancing eastward, dumping rain on much of the southeast. In return, the rivers here in WNC are responding in a big way. Check out the stream levels here. The Davidson was at 992 cfs around 5:30 this evening. I just checked it again and the D is now at 2,410 cfs. The Davidson should be around 88 cfs or so. The D isn't the only river that has been spiking. The South Toe, which looked like this during my last trip to that area, is the complete opposite. Currently, the S. Toe is sitting at 2,580 cfs and quickly rising. Not the dry, 9cfs "river" I saw back in late September. We still have a decent amount of rain that has yet to move in. If you're planning on venturing out in an attempt to hook up with a large brown, be extremely careful! Fishing from the bank is best until the rivers look better. Wading right now is flat out dangerous. High, swift water will knock you off of your feet with ease. Not to mention potentially stained or muddy water, which can obstruct your view of the river bottom. I'd imagine the rivers will cool off in time for the weekend. Early next week looks very interesting. We may be looking at a potential winter storm here in the Carolinas according to many sources. It's way too far out to nail down any specifics, but there's a chance. Allan Huffman, a meteorologist over in Raleigh, explains the possibilities here amidst confusing weather terms and weather talk. It could be a major snowstorm or it could be completely dry with sunny skies. With that being said, we need all of the precipitation we can get. Long range forecasters say that January through March looks somewhat dry. Next summer could be bad in terms of drought and low water. Just my 2 cents. It looks like some much needed rain is finally on its way. As most of you know, the streams here in western North Carolina are getting low. Not as low as we saw back in July, but low nonetheless. As it stands right now, it looks like a healthy dose of precipitation is on the way. Notice the small bullseye of 4.84" over the Davidson River/Transylvania County area. If that comes to fruition, get your 2x tippet and 6" long streamers ready! Could change, but according to the meteorologists, it looks to hold true. First off, hope everyone had a great Thanksgiving! I just got back in town, after 3 days in Hillsville, VA. I apologize for the lack of posts over the past 7 days! I did get the opportunity to fish the pond I frequent before it freezes over though. Stayed for roughly 10 minutes. A stiff NW wind and falling temperatures made bass fishing almost impossible. Right now, waiting for the water to warm up is a wise thing to do. Unlike in the summer, you don't have to be the early bird. Trout are less active around dawn right now, typically because the water is cold and the sun isn't strong enough to warm the water. From about 9AM on into the afternoon/evening hours, the fishing will be best. If a hatch occurs, likely to be midges or small BWOs, the fishing should noticeably pick up. Up until noon or so, nymphs will be more productive. A Pheasant Tail Nymph in about a #14-20, a Prince Nymph in about a #14-16, and most other generic nymphs should do the trick. If the fish are being fickle, switch to a smaller nymph. For example, if you're fishing a #14 Pheasant Tail Nymph (which can imitate a small brown stonefly nymph) and it's not bringing fish to your net, switch to a #16, 18, 20, 22, etc. Smaller sizes tend to force trout to "taste" or bump your fly in order to figure out what it is. Trout, especially rainbow trout, have an extraordinary sensory system, so that "taste" might be as small as a slight bump. Be ready to set your hook if your indicator or fly line makes any unnatural movements. As the day progresses, small dries, such as #16-22 Parachute Adams or #18-24 Para BWOs should work, but mainly in the afternoon. The Davidson River, which is about as technical as it gets here in North Carolina, will require the use of small midges (#22-30). A beadless red or black midge or small BWO pattern on a 12ft 6x-7x leader seems to work best. All in all, it's best to keep your flies small (or smaller than you would in the warmer months). Aquatic insects grow very slowly in the winter, due to the colder temperatures and usually less food as opposed to the summer. Stoneflies however can grow rather large. A #6-10 stonefly nymph will sometimes produce some nice fish this time of the year. Speaking of larger flies, streamers are still big producers. Make sure you have some Woolly Buggers, Zonkers, Clousers, and various other streamers on hand. It's time to bring the cold weather tactics back into play. After a long and hot summer, Old Man Winter will really make his presence known. Although next week's weather might have you thinking otherwise, the cold is coming. The cold air is already pouring into the Intermountain West. Cut Bank, Montana hit about -15 this morning. That cold, (While not nearly as cold as -15) will make its way into the Carolinas. It will be warmer, with highs reaching the upper 60s to low 70s in most places Tuesday and Wednesday. Then, Friday marks the beginning of a major pattern change. An arctic airmass is slowly traversing across the west and will likely hit the Carolinas with a chilly punch. Highs Friday will probably drop throughout the day as the front encroaches upon the southeast. After the front passes, the temps take a nose dive. According to the weather models, we go from almost 70° Tuesday and Wednesday to possibly mid to lower 30s for Charlotte next Saturday/Sunday. That's highs by the way. Lows could dip into the upper teens. The mountains will be even colder. If it turns out to be warmer, great! If this potential cold shot doesn't come to fruition, December looks to be cold. So, we know the cold air is eventually coming. What does that mean for fishing here in North Carolina? It definitely means a change in tactics. Like humans, trout respond to temperature changes. If it's cold, trout are usually very sluggish and lethargic. They don't want to expend more energy than they're consuming. As a general rule, once the water temperatures hit about 50° and above, trout tend to become increasingly active. When water temps dip below about 50°, trout tend to become more and more lethargic. Throwing big dries into a deep pool might have worked like a charm throughout the summer, but probably won't produce much in cold weather. Of course that's not to say dry flies aren't effective in the dead of winter. It just simply means you're much more likely to catch more fish on nymphs than on dries most of the time. 1. Take it slow. Being the early bird out on the water won't really help. In the winter, it's always a good idea to allow the water to warm just a bit before fishing. 2. Use slow presentations. Ripping a streamer across a pool probably won't work when it's cold. Slow the retrieval down and let the fish have time to slowly get to your fly. 3. Other than giant stones, most aquatic insects are relatively small during the winter months. They grow very little when it's cold. So, using smaller flies will usually entice more fish. A smallish #16-22 BWO nymph will more often than not produce fish. 4. Keep and eye out for hatches. Blue Winged Olives, or BWOs are known for hatching on overcast, dreary winter days. They can turn an uneventful day of fishing into a great day. A midge hatch can also turn things around. Fishing near springs or inflow tubes such as the one above can improve your success. They usually retain a constant temperature and provide a small, ice free area. 1. Dress in layers. That way, you can take off or put on layers as the temperatures change. A lot of folks prefer Under Armour or some type of moisture wicking fabric. Simms WaderWick crews are perfect as well. A heavier fleece jacket, is excellent over the wicking layer. 2. Loose fitting, moisture wicking socks. Loose fitting socks or any sock that doesn't constrict your feet and ankles is ideal. Blood has to reach your extremities in order to keep warm. 3. A base layer under your waders will keep your legs warm. Avoid cotton sweat pants or long-johns if you can. If you start sweating, the cotton will collect that sweat and you'll soon become cold. 4. A wading jacket will protect you from rain, snow and moisture. It will also protect against getting your clothes wet. 5. A warm hat and fingerless gloves (for tying knots) will also help immensely. 6. Carry a flint striker or a few matches. If you fall in the water on a bitter cold day far from the warmth of a building or your car, a fire can be constructed quickly to avoid hypothermia. Don't let cold temperatures and a little snow stop you from heading out to the river! If the video is slow to buffer and stops frequently, click the 720p (HD) button once. The video will then switch to 360p, which buffers faster. The above video is a short fishing report that was composed by Ian and Charity Rutter of Townsend, Tennessee. Ian and his wife Charity own R & R Fly Fishing and are renowned for their expertise on fishing Great Smoky Mountains Nat'l Park and east Tennessee. Even though it isn't a fishing report for western North Carolina, Ian shares some helpful tips that hold true for most other trout streams here in the Southeast. In the video, you'll see footage of a pair of spawning brown trout. While they look like they're fair game for an angler, they are best left alone right now. If you see two fish in shallow water, they're spawning. We would like to have more trout in the streams next year! A spectacular weekend is unfolding in western North Carolina. Highs tomorrow will climb up into the 60's with sunny skies and a light breeze. Sunday will feature much of the same, with some clouds and maybe a few widely scattered showers in sporadic spots. All in all a great weekend. With the great weather we're seeing, you can expect fishing to be fantastic. The Delayed Harvest waters, from Stone Mountain to the Nantahala are on fire. I've been seeing a lot of successful reports from folks. Big fish are being caught too. Lance Milks over at the Trailmarker blog caught this pig on a DH stream a few days ago. Brown trout aren't nearly as common as brookies and bows on DH waters here in NC. The state doesn't stock as many browns. So, when you catch a 24", 5 pound brown, it's definitely a sight to behold on DH waters. A 24" 5 pound brown caught anywhere is a sight to behold come to think of it. These hogs can be fooled (most of the time) by using Pheasant Tail Nymphs, Princes, San Juan Worms, Lightning Bugs, Stonefly Nymphs, large midge patterns (#14-16), parachute Adams/BWOs (#16-20), BWO Nymphs (#16-20), and most other relatively generic patterns. Check the "Recommended Flies" tab above for a more comprehensive list of suggested flies. As far as leaders go, it all depends on what water you're fishing. A 9ft 5x or 6x leader will be fine on most DH waters. A 12ft 6x-7x leader is best on the Davidson River due to the smart fish and the low, gin clear water. If you want to explore some wild water this weekend, a 9 ft 6x-7x leader (depending on size of the stream) should be fine. Stealth must be used to get close to wild fish. They are unbelievably spooky with the low water. Practice your bow and arrow and side arm casts. If obstructions behind you allow, try to stay as far away from the pool as you can and make a forward cast, delivering the fly from a distance. If you can see the fish, they probably already saw you and are diving under a rock. Allowing the fly to lightly land on the surface of the water with little to no fly line floating over the fish is the key to success. It takes some practice, but it should greatly improve your catch rate. If you are fishing calm, slack water, be extra cautious. Wild brookies or "specks" prefer calm, slack water, so they are extremely spooky. Wild fishing is tough right now! Hang in there, spring usually brings with it higher water and better wild stream fishing. If you head out this weekend have fun! Report back! THFF.com now has an affiliated blog! I just put the finishing touches on the brand new Carolina Fly Tying Blog. It's here that I will post most of the tying articles, pictures, tips, tricks, etc. I probably won't post as frequently as I do here at THFF, but I'll try to post as much as possible. So, tell me what you think. Suggestions, comments, and questions are more than welcome! The WNC Fly Fishing Expo and a little fishing made for an excellent weekend. I left town yesterday morning bound for Asheville. 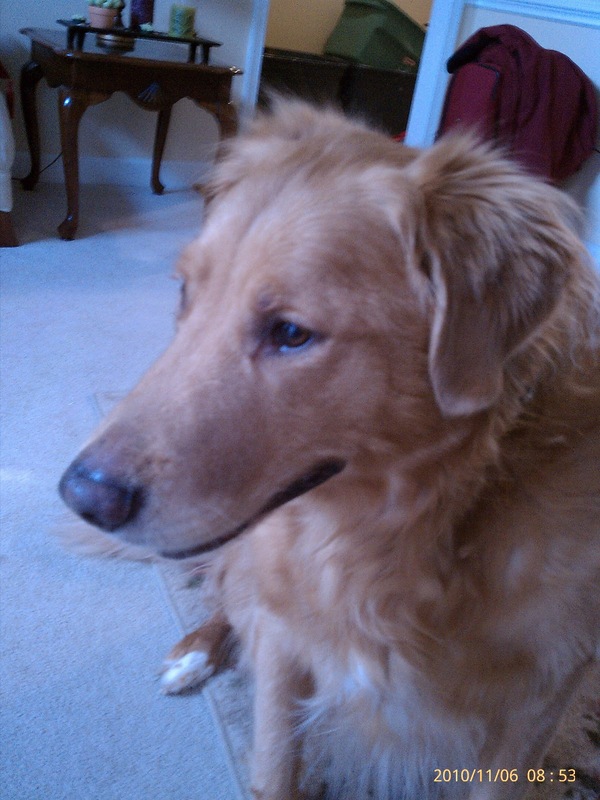 As I packed the truck, our golden retriever knew we were leaving. The first time he sees the fishing gear being packed, he quickly becomes excited almost to point where he can't control himself. Once you say the words "By-by" he'll break through the storm door and race to the truck. "Not this time," I said, and he eventually calmed down and realized he couldn't tag along this time. His reaction to our arrival home was "Oh... yeah... you're home". "I'll just be over here if you need me". Greeted yesterday AM by a sad retriever. Couldn't go fishing this time. The expo went very well. I was fortunately able to meet and hang out with a good number of friends and fellow anglers. Brad Sprinkle, Randy Ratliff, Jule and Colin McDowell, and Frank Smith being a few of them. Brad Sprinkle (teachrtec over on the THFF Forum), who owns Trash Flies.com allowed me to tie at his table. If you've never watched Brad tie, you owe it to yourself. Brad has created some of the most creative and effective flies you'll ever see. Brad incorporates copper wires from electronic cords, wire insulators, foam from flip flops, and "trash" from household items. He calls his creations "Trash Flies". They're made from things the average tyer wouldn't think of using. It's truly amazing what you can use for fly tying. Frank Smith, owner of Hunter Banks Fly Shop, asked Colin and I if we were able to possibly tie at a smaller tying class/small convention in March, so that event is quite possibly next on my list. Don't know many specifics though. Then, Troutfest 2011 in May. A decent North Mills rainbow. Glover McMurray's masterpiece. Creative as all get out. Brad Sprinkle's mouse pattern made from the foam off of a flip flop. Great Fishing! Gearing up for the expo. ﻿﻿﻿Albeit it was cold, we still pressed on and opted to hit 2 rivers today. They didn't hit us back. 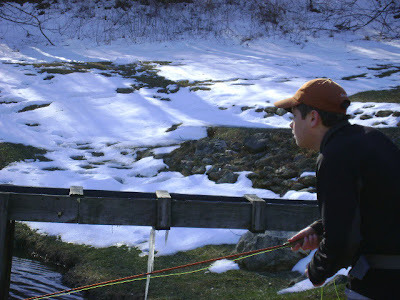 The fishing was great despite cold temperatures and sporadic snow showers throughout the day. I met Jule McDowell and his son Colin at the Davidson River around noon. They both fished the North Mills that morning and mentioned that there are plenty of fish to be caught. Jule said they caught 20. He also added that the fish were feeding on BWOs in the middle of a snow shower, which tells you the stockers are starting to figure out how to be real trout. Speaking of real trout, the Davidson, which has to contain some of the smartest fish in the east, was fishing well. It was an unusual day though, as the fish on the Davidson were actively pursuing streamers, while the stockers on the North Mills seemed to prefer midges and tiny BWO nymphs. Usually it's the other way around. About 15 minutes into fishing the D, I hooked into a decent sized brookie. He chased down a small olive Zonker and inhaled it 5 feet from me. In the end, he threw the fly right when the net touched him. Colin and I agreed that it was a landed fish. We all received more strikes and misses than hook ups, but the D treated us relatively well. If you get a strike, it's a good day on the Davidson. If you've ever fished the D, you know exactly what I'm talking about. Around 3, we all decided that the North Mills would be a great place to finish the day. We were right. The afternoon was a little slow though. Colin and I didn't hook into fish immediately. It took a while to pinpoint the exact pool that the fish were congregating in. They haven't learned that it's okay to spread out on the river. After about 25 minutes we discovered the pool. Colin took off upstream in an attempt to catch a monster brookie he saw this morning and I took the pool with the congregating fish. My first fly was an egg pattern. I know, non-purist, but the stockers eat them like candy. Eggs are working well right now, as the browns and brookies are spawning. Fish will sit just downstream of the spawning fish and gorge on small eggs that get dislodged from the redd. To my surprise, the fish were not going to have anything to do with an egg pattern. After scratching my head, I tied on number two, a Hise's Hetero-genius Nymph. The fish approved of the HHGN. A trout may have a brain the size of a pea, but they can sure decide what fly they want and what fly they'll allow to pass them by. Overall a good day with some great folks. I'm doing a little fly tying to round off a fantastic day. Preparing to head up to the WNC Fly Fishing Expo in the morning. Folks who attended today said that it was a great show. Looking forward to tomorrow. I will be tying from 12:30 until 4, so if you see a guy in an orange Simms hat speaking gibberish, say hello! Hope everyone who attends has a good time. See y'all tomorrow! Webcam view atop Purchase Knob in the Smokies. Picture courtesy of the NPS. (it updates, so you'll have a better view during the day. 'Tis the season. Snow is starting to fall in the Smokies as I type. The National Weather Service issued a Winter Storm Warning for Swain, Madison, and Haywood counties in western NC and it looks like areas along the NC/TN border (mainly 3,500 ft+) will see generally 2-4" with isolated 6" snowfall accumulations. Peaks such as Mt. Leconte are possibly looking at as much as 7". What does snow have to do with fly fishing you ask? Snow is a welcome sight to see. As long as it isn't a crippling blizzard the mountains occasionally experience, it's a good thing. Unlike rain, snow usually sticks around for a while and then slowly melts, feeding water ever so slowly into the ground. The big story in most places will be the cold this weekend. Despite cold and snow, the fishing shouldn't be too bad, but it won't be the best. Colder air is spilling into the area. Water temps will drop as the cold air settles in. Dust your waders off! Wet wading season is drawing to a close. So is terrestrial season. Any remaining terrestrials will be killed by the bitter temperatures rolling in from the north. You may see some tiny black ants though. Fishing will probably be a little slow in the morning, given the temps are projected to dive into the mid to low 20s. After the sun warms the water (by about 10 or 11) the fishing will likely pick up. Right now, it's best to fish nymphs in the morning and dries in the afternoon. A Pheasant Tail Nymph in about a #16-22 or a Tellico Nymph in about a #10-14 should produce fish as far as nymphs go. Para BWOs or Adams in #18-24 should work well for dries. Don't forget to chuck a streamer! The browns are aggressive and big. They'll chase down any potential threat (even a little streamer). Throw a Zonker or Woolly Bugger close to the bank and strip it in with short jerks and twitches. A good rhythm would be twitch, twitch, twitch, stop, twitch, twitch, twitch stop. Check the "recommended flies" tab at the top for a list of some more suggestions. The WNC Fly Fishing Expo begins tomorrow at 9am. Judging by all of the talk I've been hearing, it looks like the show will be a hit. If you can, come on out and enjoy! Fly casting and fly tying demos, programs, vendors, clubs, and great food are just a few of the things that will be present at the expo. I'm leaving town in the morning, bound for the Davidson River. Fishing the D with some friends. I'll have a report probably tomorrow night when I get back to the hotel. We're crossing our fingers for a good day. Just a note... If you are driving from Tennessee to get to the expo, Newfound Gap Rd. (US441) is closed due to the snow. I'm sure a lot of folks were hoping to take the scenic route via Newfound Gap Rd, but the snow won't allow. I-40 will be your best route. Don't hold back from coming. The snow is confined to the higher elevations. Asheville, Brevard, Hendersonville, Waynesville, etc will be fine. No worries at all. Snow showers are in the forecast but not much in the way of accumulations at elevations below 3,500 ft.